Singapura cat breed information and advice. Singapura cat breed information and advice. Singapura cats have many personas packed into one petite frame! One of the smallest breeds in the cat fancy, Singapuras have a big personality for such a tiny cat - one minute you'll see them scurrying up curtains and investigating the contents of every cupboard, then the next minute they will curl up on your lap for cuddles. One thing that many breeders say is that Singapuras will become a big part of your life and your family - whether you like it or not! Jean Bates, chairman of the Singapura Cat Club, says: "I always call them interactive cats who want to be involved with everything you do. Every time you open a door they are through it - in the wardrobe, airing cupboard and kitchen cupboards! They need lots of love and attention and they remain kitten-like even when they get older." Singapuras are mischievous and inquisitive, so you may need eyes in the back of your head to make sure they don't accidentally get themselves locked inside cupboards! Jane Brooks of the Progressive Singapura Cat Club says: "You are not so much an owner of a Singapura but more a member of their family. They will be a caring and affectionate friend wanting to be involved in all that you do with lots of love to give. Once owned by a Singapura, you will never want to be without one. They have a charm and personality all of their own. "They like to be off the ground and can often be found on the top of furniture, on shelves or sitting on their owner's shoulders - anywhere to get a better view of the world! They also enjoy warmth and if not with their owners, they can be found in the warmest spots." Grooming these shorthaired cats is easy as just a quick brush every few days is more than enough to keep them looking their best. Some owners will give them a wipe with a silk cloth if they are going to a show. Jane adds: "Indoor cats may require their claws to be clipped as they quickly grow to sharp points, so a strong scratch post is a must." Recently it was found that the breed was carrying Pyruvate kinase deficiency (PKDef), a genetic disorder that can cause anaemia. There are two stages to the disease - a carrier who will not show any symptoms, or an affected cat which can become anaemic if he or she has any other underlying illness. Jean adds: "We do not encourage breeding from any affected cats as they should be neutered and removed from the gene pool. "Cats used for breeding should be tested to ensure that they are clear." Expect to pay a minimum of £450 for a kitten and he should be registered, fully vaccinated and come with a five-generation pedigree. Jean says: "A responsible breeder will also provide you with a diet sheet and food, and I always send a comfort blanket and some toys. A decent breeder will ask lots of questions - this is not because they are being nosey but because they are looking for the best possible home for their kittens, be it as pets, show or breeding animals." Singapuras originate from the Southeast Asian island of Singapore, and take their name from the local Malay name for the island - meaning 'Lion City'. 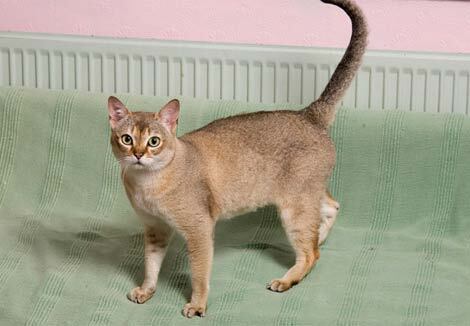 The first Singapura cat was imported into America by Hal and Tommy Meadow in the mid-1970s, then in 1980 another cat, Chiko, was imported from the SPCA (Singapore equivalent to RSPCA) into America. Singapuras were first imported into the UK from the USA in 1988 by Carole Thompson, who brought in a pregnant female called Imagos Faye Raye of Usaf. She subsequently gave birth to three kittens, Muffy, Mimi, and Kuan. Kuan later went to Canada and became a Quadruple Grand Champion with the American Cat Fanciers Association. The look of the breed has not changed since these early days.